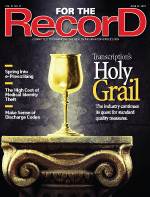 Is the industry prepared to handle new HITECH rules that bring greater scrutiny to dictation and transcription practices? The people, places, and legislation that made headlines—and some that didn’t—are recapped by an elite panel of experts. Use of this technology during the past several years has seen a major boost, but several roadblocks still stand in the way of e-prescribing reaching its full potential. Recent research indicates that being overweight makes it more likely that a person will develop nonalcoholic fatty liver disease. According to a survey, one third of healthcare business associates are unaware that the economic stimulus package requires them to comply with HIPAA health data protection rules. There are two ways for physician practices to skin the EHR cat: implement it yourself or partner with a health system. The National Library of Medicine has published a draft map linking content from SNOMED CT to ICD-9-CM billing codes. A new health information site will feature expert answers from celebrity physicians, as well as high-profile institutions such as Johns Hopkins Medicine. 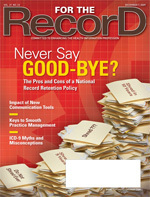 Opponents argue that a proposed 10-year nationwide record retention policy would not serve the best interests of healthcare organizations or consumers. From coding properly to establishing morning huddles, there are several steps physician practices can take to make operations more efficient. The industry is opening its eyes to the value of text messaging, e-mail, and observations of daily living. Several factors have led to an increase in the incidence of this painful and debilitating condition that is often linked to other health problems. 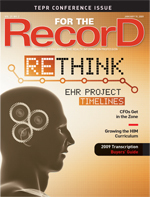 U.S. physicians lag behind their international counterparts when it comes to EHR adoption. Separating fact from fiction in the world of ICD-9 coding can help facilities boost revenue and avoid fraud issues. The Drummond Group, an interoperability testing lab, announced plans to develop an EHR certification program. A Web-based tool helps payers reduce the time required for testing the 5010 transaction set. New York state has unveiled a new database designed to inform consumers and health insurers about standard reimbursement rates for out-of-network care. Application service provider and automatic speech recognition solutions are changing the landscape of the medical transcription industry. Healthcare organizations in a hurry to implement an EHR system in order to take advantage of federal stimulus money may be in for a fall. As anxiety over the introduction of ICD-10 mounts, coding professionals look to a new tool to ease the transition. Identifying the causes of older adults’ balancing difficulties is of critical importance to fall prevention. Cancer registrars must take advantage of educational opportunities and their networking skills to make sure they have a place in the EHR era. 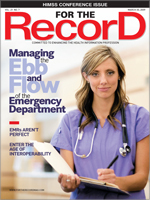 A new study spotlights the inherent value in reusing EHR data to improve quality of care. MDLiveCare, which offers consumers on-demand teleconsultations with board-certified physicians, will enable data from the sessions to be embedded in PHRs from Google Health. 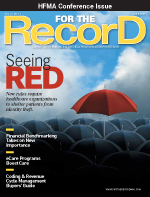 RecoverIt is designed to reconcile reimbursement data to ensure prompt payment. 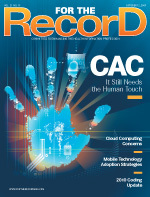 Data reveal that 80% of healthcare organizations reported a data breach within the last year. Kaiser Permanente and Montefiore Medical Center are two healthcare organizations that have success with patients and physicians exchanging information via the Internet. Digital signature technology has helped healthcare organizations get more out of their EMRs and curtail chart deficiencies. Learn the steps that need to be taken to ensure operations are kept in running order the next time your EHR system fails. Advances in CT technology are allowing clinicians to perform whole-brain perfusion studies. In these days of stimulus funds, it’s more important than ever to know the facts about the leading vendors. The HITECH Act promises to have a wide-ranging effect on how facilities go about protecting health information. Recent federal changes to the EHR certification process threaten to diminish the CCHIT’s role and increase the standing of open source technology. 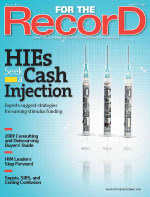 Healthcare organizations looking to meet the new HIPAA regulations can implement a tool to measure their breach index. Searching for a new blog to satiate your quest for HIT chatter? Initiate Systems has launched a new platform for master data management. Researchers say doctors could predict a patient’s risk of receiving a domestic abuse diagnosis years in advance by using EHRs as an early warning system. Coders face the conundrum of producing top-of-the-heap work while at the same time maintaining a pace that satisfies reimbursement types who demand payments yesterday. The authors of a new book state their case as to why this technology needs to play a more prominent role in the dissemination of healthcare information. 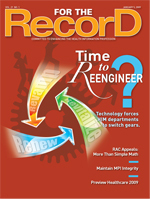 Installing bar-coding technology raises patient satisfaction, decreases the chance of mistakes, and changes workflow throughout many departments. 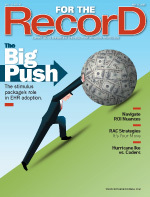 Three industry leaders share their thoughts on outsourcing, the ARRA, and other hot topics. Florida’s Agency for Health Care Administration has released a crosswalk tool for healthcare providers to look at federal and state privacy and security rules for exchanging data. The National Library of Medicine has launched a Web site to support the electronic exchange of standard newborn screening data. Coding professionals will be pleased to know there is a new tool available to help them master RAC regulations. With the federal government in a generous mood, it seems like the perfect time to adopt new mobile technology. However, experts caution that hospitals would be wise to check with their physicians first. Healthcare facilities are taking a huge risk if they rely solely on computer-assisted coding technology to satisfy their billing needs. Cloud computing has its flaws, but some healthcare organizations view the practice as a viable option to help curb costs and streamline the archiving process. A new ultrasound system helps clinicians better visualize treatment targets without added radiation. Value-based purchasing is the most recent advancement in the reimbursement system for Medicare patients. Our intrepid and overworked coding expert summarizes the changes occurring this month. The AHIMA is set to receive a grant to continue its State-Level Health Information Exchange Consensus Project. WebMD debuts Medscape Mobile, a free iPhone and iPod touch application that lets physicians look up healthcare data. In an effort to expedite the 5010 transaction process, Foresight has integrated interpretive content into selected products. By gathering data electronically, the state’s cancer coalition hopes to bring providers and researchers the most up-to-date information possible. With more than a decade of experience working with CPOE, the leaders at Alamance Regional Medical Center give their thoughts on how to ace the implementation process. Making sense of the 1995 and 1997 guidelines is virtually impossible, according to a practicing physician and certified professional coder. Innovative technology continues to improve the implementation of nursing home functions, from resident services modifications to facility management nuances. Thus far, Parkinson’s disease treatment has mostly focused on controlling the disease, but now there’s thought that a new strategy could lead to a cure. Getting a grip on document management processes is a good first step on the path to EHR enlightenment. The State Alliance for e-Health offers advice on preparing for HIT regulations. 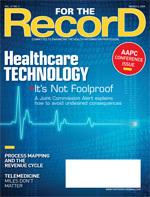 Opportunities are available for HIM professionals to ingrain themselves into the new EHR-centric world of healthcare. 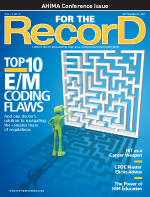 Learn tips on medical decision making in E/M coding. New federal mandates included in the HITECH Act please privacy proponents and reshape policies for business associates and covered entities. While the economy trips and stumbles on its way to a full-blown recovery, healthcare organizations are examining point-of-service payments as a means to boost revenue flow. During the early stages of EMR planning, healthcare providers are employing lean management practices to identify and eliminate waste. A KLAS report suggests most executives and clinicians at small rural hospitals are dissatisfied with HIT service providers. A project to discover the reasons behind workarounds associated with bar-code medication administration yielded interesting results. With RACs keeping a keen eye on excisional debridement codes, now’s a good time to revisit how to handle this tricky diagnosis. Two of coding’s biggest names have gotten together to create a new software package. 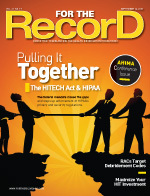 HIPAA modifications included in the HITECH Act promise to revamp many release-of-information processes, according to industry experts, who say hospitals need to start educating staff on the new laws. Step inside the doors of three medical centers that have implemented wireless technologies to improve communication and speed access to patient information. As healthcare information becomes more mobile, facilities face a series of new security challenges. Patients who suffer from mental illness in addition to medical problems—related or otherwise—face unique challenges when it comes to receiving proper care. Researchers at The George Washington University estimate that as many as 45,000 physicians may be eligible for Medicaid subsidy payments for adopting EHRs under the stimulus plan. The differences between observation and inpatient designations have a great effect on how hospitals are reimbursed. Issued by ASC X12, a new implementation guide supports the exchange of PHR data between health plans. According to a new survey, Medicare beneficiaries overwhelmingly embraced using the Internet to manage their health. There’s money to be had for enterprising organizations looking to obtain government funding to bolster the power of health information exchange. As the industry faces innumerable challenges in the years ahead, up-and-comers and veterans alike are emerging to help make a difference. For years, experts have questioned the logic behind the rules that govern the guidelines for properly recording the presence of these two conditions. Identifying and treating sleep disorders in older adults contributes to improved cognitive function and quality of life. This special section provides a comprehensive listing of companies that can lend a hand. E-prescribing technology that features clinical decision support options can lead to quality improvement, cost savings, and a reduction in medical errors. Although Arizona has a high EMR adoption rate, a new report finds that many physician groups are “deinstalling” the systems because of high costs and inadequate training. 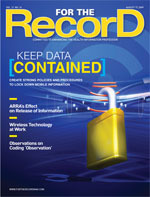 In 2010, the American Medical Association will launch a Web portal to let physician members access patient information in Microsoft’s HealthVault PHR system. A new PHR will be licensed at no charge to TriZetto’s qualifying payer customers for use by their providers and members. To avoid trouble, experts recommend several best practices for establishing an auditing program that will provide an inside look at an organization’s coding operations. The introduction of the visible black character methodology has helped some healthcare organizations make sense of their transcription costs. Nevertheless, experts say HIM managers must still be on the alert for billing errors. Learn how two healthcare organizations used the federal Stark law and antikickback statutes to gain an advantage on the road to comprehensive EHR adoption. 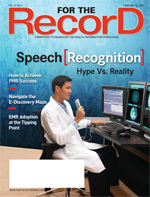 Speech-enabled EHRs can help healthcare organizations develop stronger and more rich documentation while limiting the amount of typing required from physicians. 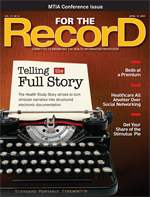 A new study suggests that patients are ready to embrace the transition to EHRs. Meet Donna Littrell, the executive director of a new organization whose goal is to keep transcription jobs in the States. The March arrival of a revised ABN form has made an impact on items expected to receive the cold shoulder from Medicare. Plans are underway to create a service that will allow patients to consult with physicians 24 hours per day via the Internet or phone. A national report found that hospitals don’t do enough to discipline problem doctors. Perot Systems has announced special financing options for healthcare providers looking to take advantage of stimulus funding. Medical Identity Theft: Will the Real John Doe Please Stand Up? Lax healthcare organizations face serious consequences if proper safeguards aren’t in place to deter criminals—including the mob—from gaining access to patient information. The AHDI and MTIA assembled a Quality Assurance Best Practices workgroup to identify metrics and definitions for a credible, measurable QA program standard. Experts expound on the powers of e-prescribing, a technology that comes with some baggage but is well worth the trouble in the long run. Entering the correct discharge status code depends on excellent documentation and the coder’s knowledge of the available options. A meaningful use Web site allows healthcare professionals to submit input on how providers can take advantage of stimulus funds. GE’s new healthymagination project promises to devote $6 billion to improving the nation’s HIT infrastructure. A new solution identifies possible medical identity theft and provides advice to manage, report, and monitor Red Flags Rule program compliance. This tool may prove to be invaluable to healthcare organizations looking to get their finances in order during these threadbare times. Around-the-clock remote monitoring of ICU patients improves patient safety, helps solve physician shortages, and boosts the level of care in this demanding unit. The Federal Trade Commission’s new Red Flags Rule—designed to help protect patients and providers from medical identity theft—has healthcare organizations examining its consequences. 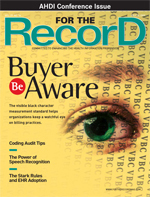 Learn about the vendors who help healthcare providers get more bang for their bucks. A report raises concerns over the “immunity” granted to HIT vendors. When paper and electronic records mix, it takes preparation and planning to make the system effective. 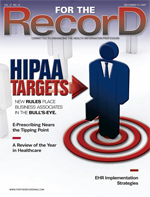 Hungry for HIPAA information? A new Web site purports to be the first educational wiki community dedicated to the federal regulation. The advocacy group Consumer Watchdog has alleged that Google contracted with at least two firms to lobby for HIT-related provisions in the federal economic stimulus package. A tool for claims analysis, risk assessment, and appeal management protects against RAC audits. Find out how the addition of an associate’s degree requirement may reshape the registrar profession. Properly designed clinical decision support systems can give time-conscious physicians an edge while still allowing them to practice patient-specific medicine. Just when a hospital’s financial team seems to have a grip on the payment system’s complexities, something comes along to further complicate matters. Digital signatures can help healthcare organizations move “paperwork” along faster and keep HIPAA violations at bay. The FCC’s Rural Health Care Pilot Program has allocated $46 million in funding to connect rural hospitals in nine states to five telehealth networks. The American Medical Association is planning to offer a Web-based health information exchange solution to its 240,000 members and other interested physicians. A documentation solution helps healthcare professionals automatically capture clinical notes in an electronic health record. President Obama’s decision to pump billions of dollars into the HIT sector promises to affect the industry in a myriad of ways. Learn what experts think of the HITECH Act’s chances for success. HIM departments enter treacherous territory when they face the complexities of the release-of-information process. Healthcare organizations that heed these 10 tips for RAC preparation will be all set to weather the storm. The right diet can help those who suffer from chronic obstructive pulmonary disease lead happier, more productive lives. This enticing list of industry players should stimulate interested buyers. According to researchers from the Harvard School of Public Health, fewer than 2% of U.S. hospitals have installed comprehensive electronic health record systems. In this firsthand account, learn how Hurricane Ike has had a devastating effect on the lives of the staff at The University of Texas Medical Branch in Galveston. The U.S. government has launched a Web site designed to provide mental health resources to residents affected by the economic recession. 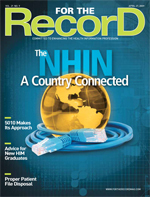 The Nationwide Health Information Network is in the process of demonstrating how technology and cooperation can lead to a more robust healthcare system. Often viewed as a companion project to the implementation of ICD-10, the forthcoming 5010 standards promise to fine-tune electronic claims transactions. By following guidelines and protocols, healthcare organizations can relieve the stress and anxiety that often accompany the task of destroying patient files. When mental illness is recognized and diagnosed in the early stages of Alzheimer’s disease, appropriate treatment can often improve cognitive function. Here’s a sampling of the new technologies introduced at the recent conference. Tampa Bay, Fla., officials plan to rid the city’s healthcare system of paper by converting 10,000 regional physicians to e-prescribing. Securing that first job and then making good as a new hire can leave any graduate feeling a bit anxious. There are several key components that make up an effective personal health record. Wouldn’t it be nice to know how long of a wait you could expect before bringing your child to the hospital for stitches? A New Orleans health system now provides emergency department wait times online. A new certification program will train HIT consultants to implement OpenVista. To collect all the necessary data for quality patient care, the Health Story Project has set out to develop and promote information standards that support the flow of information between narrative documents and electronic health records. Healthcare organizations that can alleviate bottlenecks in patient flow have a leg up on the competition in terms of patient satisfaction and quality of care. YouTube, Facebook, and Twitter offer a golden opportunity for hospitals to enhance their online presence and increase consumer awareness. A study shows that physicians may bypass the economic stimulus funding, noting that the status quo may be less trouble and less costly than if they tried to implement an electronic health record system, even with the incentives. The federal government has launched a Web site where consumers can share their thoughts about health reform. An unfathomable amount of cash is available through the president’s economic stimulus package. Acrylic block radius walls may help hospitals handle HIPAA regulations while creating an attractive waiting area for patients. By installing emergency department information systems, facilities are hoping to improve patient care, streamline workflow, and maximize reimbursement. In this day and age, it’s necessary to make sure data security measures are up to speed, or serious privacy issues may develop. The recent snafus in the Veterans Affairs’ electronic medical record illustrate that healthcare organizations need to be cognizant of the potential for mishaps. The Rockefeller Foundation, the Vodafone Foundation, and the United Nations Foundation have announced the launch of a new campaign that will use mobile and computer technology to improve healthcare in developing nations. As the stimulus bill pours money into the adoption of electronic health records, now is an ideal time to enter the age of interoperability. An online encyclopedia aims to provide consumers with health information, as well as an opportunity to interact with each other and medical professionals. Virtual File Store is the industry’s first cloud-based archiving solution to help enterprises meet data storage challenges. Concurrent documentation programs are helping healthcare organizations achieve improved efficiencies by obtaining diagnoses at the point of care. A fairly new movement that seems to be gaining steam, the mHealth Initiative spotlights how these everyday devices can help improve the flow of information in a variety of settings. These GPS-like devices serve many useful functions inside healthcare facilities, but privacy advocates worry there are other consequences that are far less appealing. EMR databases can obtain information as effectively as randomized clinical trials, according to a report by researchers at the University of Pennsylvania School of Medicine. A medical transcription service owner discusses how outsourcing can help ease the strain for hospitals and clinics looking to cut costs. The new Health Workforce Information Center contains data on workforce topics and funding resources, furnishes relevant publications, and connects users to workforce experts and federal programs. IBM, Google, and the Continua Health Alliance are partnering on software that enables personal patient monitoring medical devices to automatically send medical data to a personal health record. A recent sentinel event alert issued by The Joint Commission provides information and best practices on planning, implementing, and managing HIT and converging devices. Having problems receiving proper reimbursement for ambulatory services? By analyzing the process in greater detail, you may just find the answer. 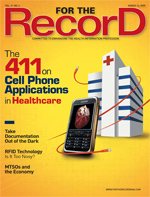 No longer an anomaly, various forms of connected health, including remote monitoring, are reshaping ideas about how providers can give consumers quality, convenient care. Examine the complications that face mothers with PCOS and the dietary and medical guidelines they should follow. The national HIT strategy should focus more on information exchange rather than electronic health records, says a report from the consulting firm Booz Allen Hamilton. To ensure compliance, coding managers need to make themselves available to answer any and all staff questions. Coders who can’t afford expensive resource books will soon be able to turn to a free Web site where they can share knowledge with colleagues. An instant alert system gives doctors’ phones secure access to healthcare networks in real time. 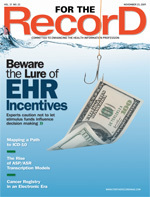 What PHR features pique consumers’ interest enough that they’ll actually engage in data entry? What are the roadblocks preventing more widespread use of this much-touted healthcare tool? Experts say healthcare organizations need to develop well-rounded policies and form task forces to deal with the ever-increasing pressures of storing and retrieving electronic information. When it comes to speech recognition technology, can healthcare organizations separate fact from fable? A new task force hopes to shed light on the subject. Curbing costs and eliminating IT concerns would help increase EMR adoption in smaller physician practices. According to a recent survey, chief information officers are wary of the switchover to ICD-10, citing software upgrades, training, and testing as primary concerns. Eclipsys has agreed to provide an HIT learning platform for nursing students at the University of Pennsylvania. The federal government has launched a Web site that lets patients create an electronic family health tree and share it with relatives and physicians. 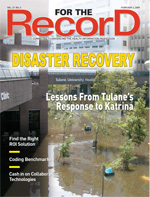 After the devastation of Hurricane Katrina, Tulane Medical Center faced the daunting task of putting its operations back together, complete with a full complement of accurate medical records. Release-of-information functions can sometimes overwhelm HIM departments, but fortunately, there are several options available to help alleviate the stress. Web-based collaboration technologies promise to push healthcare organizations to a higher level of communication and support the transfer of knowledge across various platforms. Despite disheartening news that rates are on the rise, there are steps that can be taken to help reverse the tide before it’s too late. Mayo Clinic researchers report their finds on how telemedicine can help save stroke victims. Benchmarking may seem straightforward but, in actuality, there are many variables that need to be considered to achieve the desired results. HIMSS has provided lawmakers with a blueprint for harnessing the power of IT to reform healthcare. An extended cardiac monitoring system provides instant and accurate patient information through automated data transmissions. The Commonwealth Fund has launched an online hospital quality comparison tool based on data from its national scorecard measures and the CMS’ Hospital Compare Web site. Several new techniques are available to help healthcare organizations increase their chances at having a successful IT project. To keep up with technology’s rapid pace, HIM educators need to refurbish old competencies while also designing new ones. A pair of Bentley University researchers stress the importance of the postimplementation phase, when opportunities to realize more benefits typically present themselves. With proper prenatal screening, parents can rest assured that their newborn will avoid contracting this potentially dangerous disease. This reference tool serves as an ideal starting point for healthcare organizations searching for outsourcing help or in-house solutions. The premiere of this new department features two prominent chief financial officers sharing their views on a number of subjects. A Vanderbilt University Medical Center study found that physicians who are trained using IT question their ability to provide safe and efficient care in less-wired facilities. 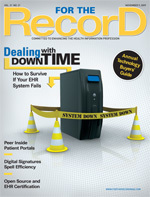 New software automates the peer-review process and allows a nurse or other healthcare provider to update patient data. A survey found that 27% of U.S. adults say they are “extremely likely or somewhat likely” to create an online personal health record to better manage their healthcare. Is your department being flooded with new technology and processes? It may be necessary to consider reengineering to create a more efficient work environment. Several factors must be carefully weighed before healthcare organizations attempt to challenge a RAC’s decision to recoup overpayments. Industry insiders weigh in on what topics will be making headlines over the course of the next 12 months. Technological innovations enhance the possibilities for older adults to stay where they want to be—at home. Although some novel ideas are still on the drawing board, advances promise to improve home safety and convenience for elders. As part of a $200 million initiative, GE Healthcare has partnered with leading medical institutions to promote the use of HIT. Keeping track of patients is no small task. That’s why HIT experts emphasize the need to maintain a spotless master patient index. M*Modal has introduced a speech recognition-enabled dictation application for the Apple iPhone. Beginning this month, BlueCross BlueShield of Tennessee will offer free personal health record software and similar services to Medicare Advantage members.